You are here: Home » What It Does » Companies identification & actions » Which people from companies have visited my website? Names of identifiable companies that visited your website. What brought them to your website. What they looked at on your website – page by page. Ideally, you’d like to know the name of the person who was on your website from each identifiable company. We need to be provided with not only the company names but also the contacts/employees that work in each specific company – can you do that? Within A1WebStats, when a company is identifiable, you can click on a link within the visit that takes you to LinkedIn. You can then filter the people within that company and decide how you will reach out to them. You may get really lucky and reach out to someone that you identify within LinkedIn, and they may be receptive to your contact AND may have been the person who visited your website from that company. BUT that’s about as good as it gets (unless you are a paying A1WebStats subscriber, which will provide you with a method that sometimes identifies the actual person who visited your website from a company). Unfortunately, we have competitors who claim to be able to identify individuals that visited your website. They can’t – all they’re doing is pulling in data (from sources such as LinkedIn) of people generally from that business. While it’s possible that one of those people went to your website, there’s no way to know for sure. There is though a workaround that will sometimes identify the actual person from a company (a workaround reserved for paying A1WebStats subscribers only). However, it is just a workaround and this type of software (ours or anyone else’s) has no way of showing you who the actual person was who visited your website from an identifiable company. A1WebStats, and similar systems, use reverse IP tracking to identify the name of a company that visited. This is relatively simple in the way that it works but it has no way of knowing the individual person who visited your website. ABC Co is seen to have visited your website, and their movement through your website pages indicates a definite interest. It could have been anyone within ABC Co that visited your website. It could have been someone with the job role you’d expect it to be. Or it could be someone working for them. Or anyone else. All A1WebStats (and other systems) see is an IP address that can be linked back to that company name who visited your website. There is nothing about the individual visitor that identifies them to any system. No secret tracking methods that pick their name from their computer. There is no way that a ‘company name’ can give you the name of the person who visited. And even if there was, it’s unlikely to be legal. Look the company up (usually via LinkedIn but also via their website) to identify people to reach out to. Even if you could work out the name of the person who visited your website from that company, that person chose NOT to make contact with you. They have looked at a few websites (including yours) and weaknesses within your website made them exclude you from their choice of potential supplier.This is the biggest reason that people don’t make contact. They are thinking about buying your product/service but aren’t yet at the point where they want to have further dialogue – even if you reach out to them.To answer this, have you considered Google remarketing, so that your business/brand continues to be in front of them in the future, so that they will remember you when they are ready to engage with a potential supplier? Your paid advertising was poor. Many businesses make themselves visible online but are unaware that they get clicks from people who wanted something quite different, but the advertising platform (e.g. Google Adwords) made adverts appear. People click through from those adverts and then realise it wasn’t actually what they wanted. Your website is visible under keyword searches (e.g. via Google) that bring visitors to your website, but they’re not necessarily potential buyers (yet). You may have website content/blogs that bring in strong numbers of visitors each month, but relatively few of those may become buyers.As an example, we (A1WebStats) have a blog that brings in 1500+ visitors each month, for a particular search phrase. We know that the majority of those people were just casually interested in the subject, but at the same time find it useful to identify the companies who did look at the blog, as the implication (from the blog subject) is that they need more business from their website. They have looked at a few websites (including yours) and weaknesses within your website made them exclude you from their choice of potential supplier. What’s better of the following two options? 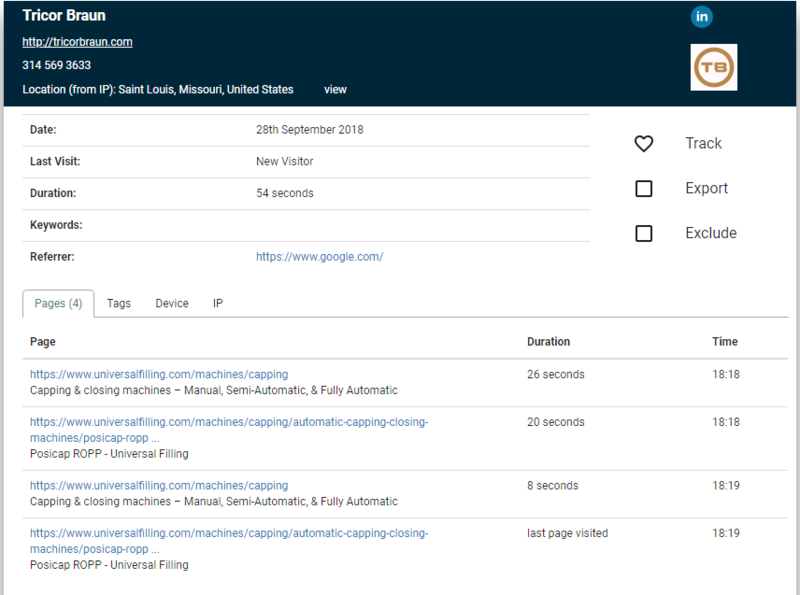 Identifying companies that visited your website, and then trying to reach out to people in those companies, attempting to gain further dialogue. Companies choosing to contact you, because your website gave them everything they wanted, compared to other websites they may have looked at before and after your website. Type in something that you may feasibly want to buy (ideally something B2B that would apply to a purchase your business may make). Click through all the results of the first page of Google (including the paid adverts). Note down the elements of each website that you did or didn’t like. Decide which, out of all those you looked at, you’d be more likely to make contact with. Realise that’s exactly how people are thinking (although they won’t write things down) when they go to YOUR company website. Now search Google for something within your own business sector. You’ll see lots of results for competitors. Then follow steps 3 and 4 above. Now take all the good elements of the competitors websites and combine them together and apply them to your website. End result: your website will contain all the good elements that potential customers are looking for and more companies will actively contact you, instead of you having to chase them. Imagine a day when all your competitors are routinely monitoring identifiable companies that go to their website. Imagine that all those competitors are chasing those same companies who didn’t make contact with them. Sit back and think how insane that is. Make your website good enough for people to make contact with you and let your competitors try and chase companies who have already engaged with you because your online presence was strong enough to win the attention of a named person within that business.